The kit is easy to use and the results are quite constant. In our experiments, erum-starved primary cells were incubated for 45min with 20µM DCFDA, then treated for the indicated time points with 1µM LPA and the fluorescence intensity was measured using a Wallac Victor 1420 Multilabel Counter. tert-Butyl hydroperoxide (tBuOOH) was used as a positive control. We tried to measure ROS release in RAW 264.7 cells using this kit. Used the kit for Microplate assay using 96-well plates. The protocol is very simple and easy to perform. 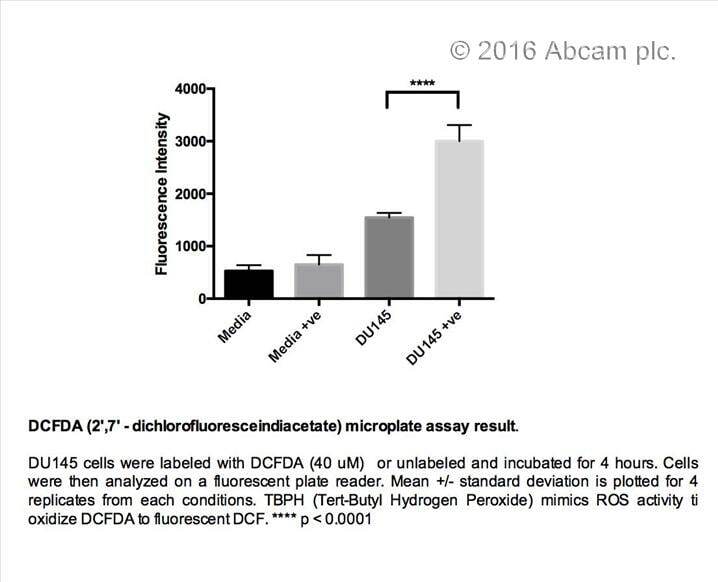 After seeding cells into the plate for overnight, loaded the cells with DCFDA (25µM final concentration) for 45 min, before treating cells with our test compound. 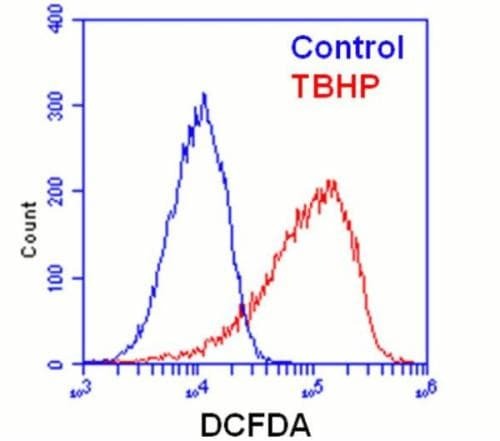 We also included TBHP, a positive control included in the kit, in our protocol. Cells were treated for 2-4h with our test compound. Unfortunately, we could not detect any increased signal in our treatment group compared to its non-treated group. Surprisingly, the positive control (TBHP) also did not show increased signal in our experiment. The results that we saw were unexpected and inconclusive. Although the protocol is very easy to perform, the kit did not work in our hands. This kit works very well. The DCFDA concentration needs to be adjusted based on the customized experimental conditions. I used 40 uM rather than 20. We used this compound (DCFDA) to detect downregulation of ROS by a novel antioxidant. 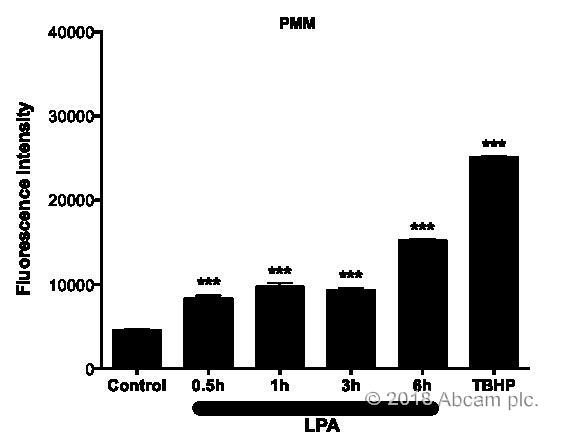 Specifically we treated MDA-MB-231 breast cancer cells (adherent) with the antioxidant compound over night, then washed it out, subsequently added DCFDA, incubated for 4 hrs (longer is not recommended by abcam). Cells were imaged every 2 hrs (cells from separate wells of a well plate for each time point) under a fluorescent microscope. 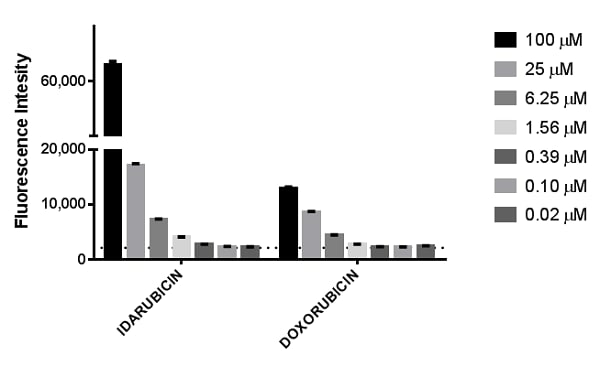 Overall the DCFDA levels were lower in antioxidant-treated cells than control, non-treated cells. In addition when we treated cells with H2O2, DCFDA levels were higher than control. One problem with using DCFDA is that the fluorescent intensity seems to vary during imaging, as if the dye is unstable. We are currently using the product to measure microglial activation after 24 hours in response to activating stimuli. The product has been giving us very consistent results and is very easy to use. The procedure is similar to one recommended in the FAQ section of the handbook.